After Christmas dinner each person at the table shares a happy memory from the previous year, or something they're looking forward to in the coming year. Then they take a whack at the pig with a tiny hammer. Don't worry, it won't feel a thing. Once the pig is all busted, you eat it. And yes, it's good. Come on-- who wouldn't love a cute little candy pig. But if you're bringing it to out of towners, be sure to fill them in on the story. We know of one little piggy who landed in the bathroom in January when he was mistaken for soap. Your best bet is Saratoga Sweets in Halfmoon. You can also find them in Crafters Gallery and other Saratoga Gift Shops. Here's a tip: don't wait until the last minute with these. Saratoga Sweets is the only place that makes them, and they can be tough to find on December 24th. Holly- This little piggy is 4 oz and sells for $4.25. He has a loop and can be hung as a tree ornament until Christmas day. Once you've got your pig, it may be hard to resist picking up a bag of pig poop or a pig puddle. 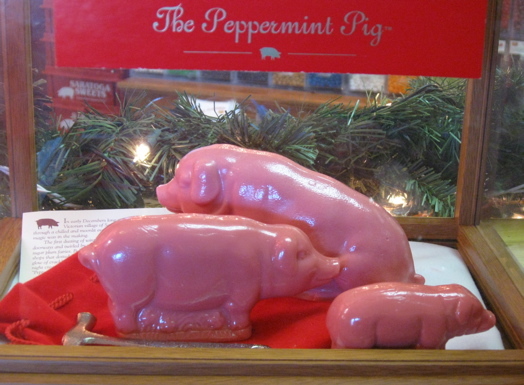 Yes, it's just the leftovers from the peppermint pig. And yes, if you look at it in a certain light, there's something kind of gross about it. But admit it, your inner 5th grader is laughing right now. And if you can bring yourself to eat it, it tastes just the same. I love your mini history lessons, AoA. I saw some at Pearl Grant Richman's in Stuyvesant Plaza earlier this week. In my German family we received pink marzipan pigs in our Christmas stockings. They were considered lucky. My family bought them at the Elk's Candy Company in the (once-upon-a-time) German section of NYC, 86th St. So glad to know I'm not the only one to have an inner fifth grader.